The collectible card juggernaut shows no signs of slowing down in Hasbro's 2013 financials. 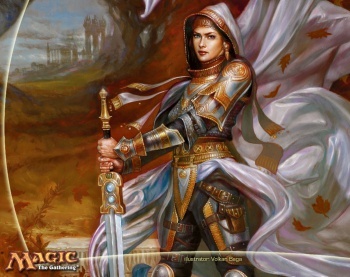 Hasbro has released its Q4 and yearly 2013 reports, and interesting details about Wizards of the Coast and its properties have come to light. Specifically, Magic: The Gathering is still growing, with the venerable CCG "up more than 20%" for the year according to Hasbro CEO Brian Goldner. Wizards of the Coast in general was apparently up 23%, interesting for a division whose primary claim to fame other than Magic, Dungeons & Dragons, did little new other than playtest a new edition to be released this year. It's possible that successful boardgames like Lords of Waterdeep and the reprints of older editions of D&D fueled overall growth. Hasbro's profits fell from $336 million to $286.2 million from 2012, apparently due to a general decline of Hasbro's "boys" brands like Marvel and Beyblade. Goldner did call out the upcoming Magic: The Gathering movie in the works over at Fox, comparing Magic to properties like Transformers with massive growth potential and emphasis on multi-year stories. Hopefully this means we'll see a Michael Bay-helmed Magic movie. Did I say hopefully? That is not actually what I meant.